The Indian state, even after seventy years of Independence has miserably failed in providing a secure and just society to its citizens. Vibhuti Narain Rai's chilling recount of India's biggest custodial killing wherein forty two Muslims were butchered down by policemen because of their religion is a stark reminder of this fact. Even more so, the fact that the incident happened just next to the country's capital is a huge shame for our nation. When the media got the whiff of the incident, it did what it does the best. It was 1987 and the media as subservient to a particular political party as it is today. It brushed under the carpet a henious crime. On the night of 22 May, 1987 near the Delhi Ghaziabad border, members of the powerful Provincial Armed Constabulary rounded up some forty plus Muslims, put them in a van and took them to a canal to shoot them and throw them in the running waters. Its thirty years almost to the incident and we have not provided justice to those families or even an answer to their mothers and fathers why thier sons were so blatantly killed. What were those compelling circumstances that the entire Indian system, including the media and the judiciary failed to bring perpetuators to book. Indeed, the matter has been allowed to die a slow death, akin to the genocide of 1984. This book is a must read for the author was the S.P. of the area where this happened. He was also one of the first people to reach the crime scene. Being a policeman himself, even though he was not directly involved in the investigation, he saw it all, he had all the accesses and knowledge of what was happening. 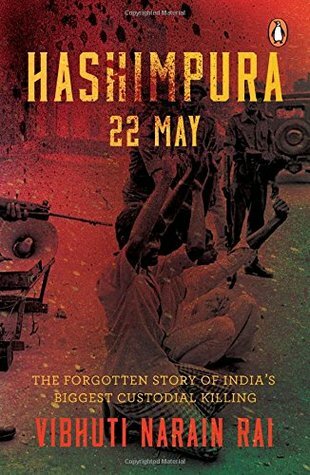 Hashimpura is a reminder of what all is wrong with our society and most of it is our mindset.